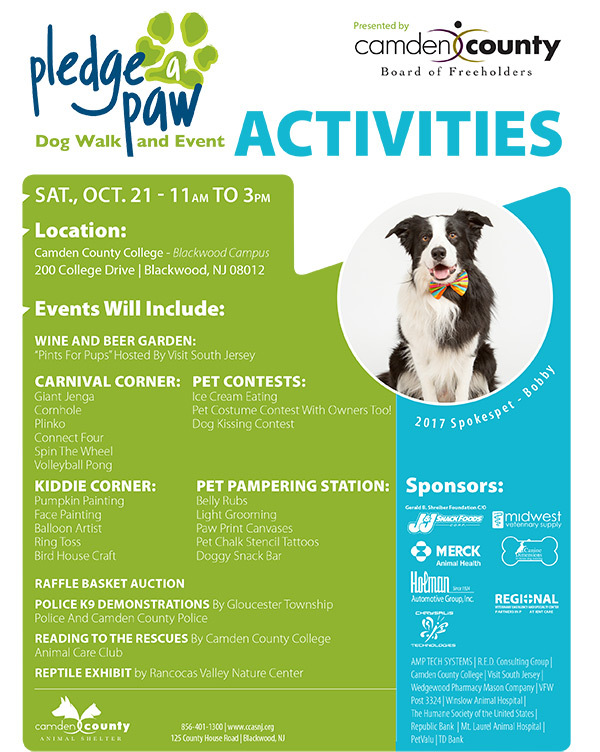 (Gloucester Township, NJ) – The Freeholder Board and Camden County Animal Shelter are hosting the 4th Annual Pledge-A-Paw Dog Walk at Camden County College on October 21 from 11 a.m. to 3 p.m. Over 200 walkers and 60 local vendors, animal welfare groups and rescues will be attending to raise pledges to benefit the animals of Camden County Animal Shelter. Camden County Animal Shelter, a nonprofit organization celebrating its 20th anniversary this year, again seeks to raise $50,000 to assist in the care for thousands of homeless animals. All animal lovers and community members are invited to join Camden County Animal Shelter in raising pledges prior to the event and at the event. This year, the event moves from Sunday to Saturday and expands on last year’s festivities, which saw 225 walkers and 40 local vendors on site and raised $50,000, impressively exceeding the $40,000 goal. Pledge-a-Paw Dog Walk 2017 is shaping up to be a “can’t miss” event for our friends on both two and four legs. A vast selection of dog walkers, local vendors, and animal welfare groups and rescues will be attending to raise pledges to further benefit the animals of Camden County Animal Shelter. 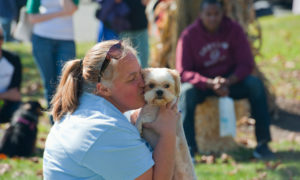 The day promises to be both a dog-friendly and family-friendly event. Activities include a one-mile dog walk, prize giveaway, entertainment and a police canine demonstration. There will also be a beer garden hosted by Visit South Jersey. Attendees are encouraged to participate in the Pet Costume contest, Tail Waggin’ contest, Best Dog Trick contest and other entertaining activities. The Camden County Animal Shelter will be showcasing their pets available for adoption in the Camden County Animal Shelter Pet Parade. Camden County College is located at 200 College Drive in Blackwood, NJ 08012. Registration is available online at www.ccasnj.org or by calling 856-401-1300 ext. 112.